At the camps on Sunday, water protectors enjoyed a rare victory and anticipated what comes next. 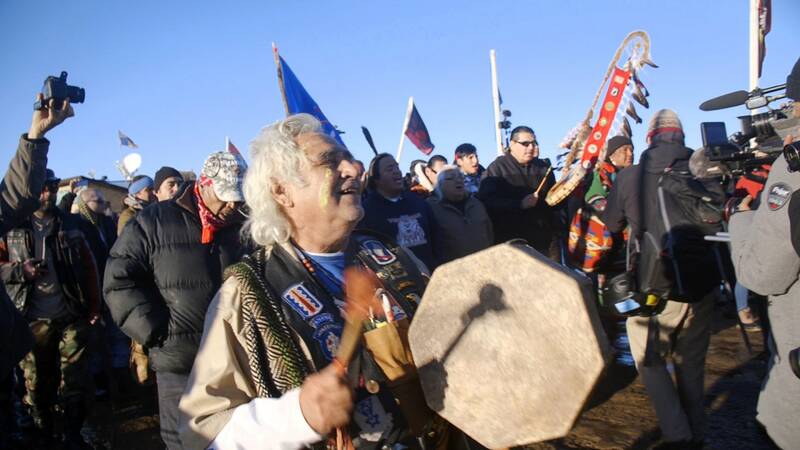 On Sunday afternoon, as the bright sun melted once-imposing North Dakota snowfall into sticky, squelchy mud, the thousands of activists gathered at the camps at Standing Rock did not expect good news. 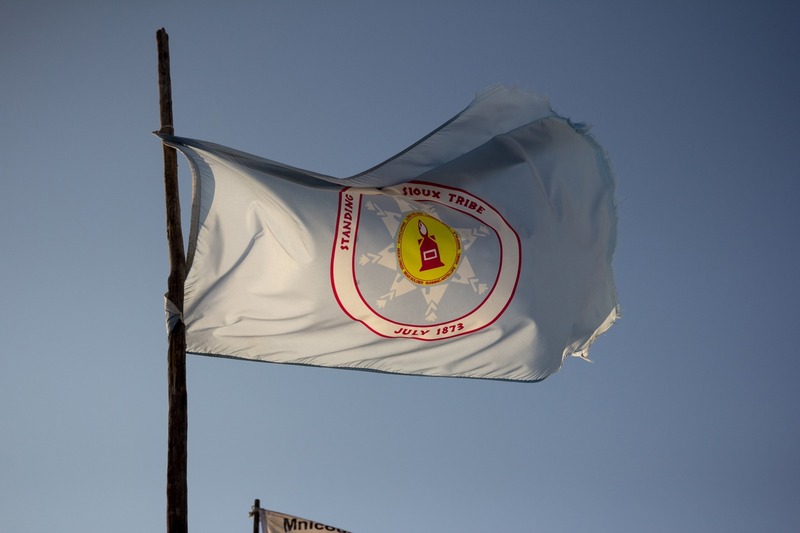 The camps — which sprung up in April in opposition to the construction of Energy Transfer Partner’s $3.8 billion Dakota Access Pipeline (or DAPL), and have continuously swelled in the months since — were largely occupied with greeting and housing a large influx of U.S. armed forces veterans, who had recently mobilized to support the effort to stop the pipeline. The sudden sea of men and women of all ages in camouflage jackets — many of them boasting Veterans For Peace patches — had created a giddy atmosphere, to be sure. But there were no expectations of concrete developments. “We have to remain in prayer, we have to remain peaceful,” he continued. “We were told by our youth, we were told by our elders, we were told by the spirits to remain nonviolent. If we remain nonviolent, we will be successful. It’s wonderful: we don’t have to stand and endure this hard winter. I want to let everybody know that it is true: we can spend this winter with our families.” As the Chairman walked off, hands sprouted out to clap him on the back, to grip his palms, to thank him right back. “We will be having a victory pow wow on Tuesday,” she added. Then she paused: “We planned that last week.” Laughs rippled in response. From there, the joyful impromptu addresses kept on coming. The actress Shailene Woodley, who has been involved in the movement from its beginnings, was there as well. She spoke about the largely ignored actions the movement had taken in Washington, D.C. back in the summer. “There were maybe 50 people that showed up to the rally because no one was paying attention,” she said. “Months later, this is worldwide news. The thing about knowledge: when you know, you can’t unknow. And now the world knows.” Nearby were a random assortment of celebrities-in-arms, including the rapper Vic Mensa and the cult writer Jonathan Ames. Dana Yellow Fat, a Standing Rock tribal councilman, was all set to go next when the sounds of songs and drums interrupted him. A crew led by Dana’s brother Courtney had marched into camp through the main gate and began circling the sacred fire. The crowd reacted in kind, whooping and shouting its appreciation. Some shut their tearing eyes, some brought their hands together or over their heads; some bobbed in place, dancing as best they could in the tight quarters. A man in a headdress jumped on a bench and turned to silently address the raucous crowd, holding one feather in his one hand and extending just the index finger of his other. Not far away, a food line curled out of the mess hall, as it had on so many other afternoons, and men and women walked out of the tent with heaping piles of green beans. Behind them, a multimedia art performance was taking place: young people holding mirrors above their heads marched in loose formation. Next to us was Route 1806. A hundred or so feet down to the north of it stood the Morton County Sheriff's Department's barricade, between the camps and the planned DAPL construction site. This is where many of the violent confrontations had taken place, where many of camp residents had been tear-gassed and pepper-sprayed. At the moment, up the hill, groups of veterans and locals were taking in the view of the sprawling camps. Back on the road at Standing Rock, the trucks of various news organizations lit up, ready to broadcast. On the far other side of camp, the floodlights of DAPL began to flick on in the fading sunlight, as they do every night. All down the road, making their way in, was a long line of cars, their headlights shining. The cars had fists hanging out of windows, drums banging; their horns were honked over and over. In extreme winter weather, the setting sun can feel like it brings true menace. Tonight, there was nothing of the sort. And yet, in the camps, the humdrum activities of life continued on. Firewood choppers swung axes, and a young man working a giant smoker carried a tray of meat to the kitchen tent. “I’ll be here till the last piece of trash is picked up,” he said. There was a bright joy, but underneath it hard work still flowed, unchanged even by the Army Corps refusal to grant an easement. As the weather dropped below 20 degrees, two teen girls trotted their horses down a main drag. “How you feeling?” I shouted up to them.